Nitrogen deposition is increased the extent to which lake algal populations are regulated by phosphorus, shifting lake food webs. Because, the patterns of human amplification of nitrogen and phosphorus trasport are different this should drive different patterns in lakes in different regions. Human activities have more than doubled the amount of nitrogen (N) circulating in the biosphere. One major pathway of this anthropogenic N input into ecosystems has been increased regional deposition from the atmosphere. Here we show that atmospheric N deposition increased the stoichiometric ratio of N and phosphorus (P) in lakes in Norway, Sweden, and Colorado, United States, and, as a result, patterns of ecological nutrient limitation were shifted. Under low N deposition, phytoplankton growth is generally N-limited; however, in high–N deposition lakes, phytoplankton growth is consistently P-limited. Our findings show that, despite the potential of watershed vegetation uptake and sediment denitrification to buffer lakes against elevated N loading, increased inputs of anthropogenic N have accumulated in receiving waters. As a result, shifts in lake N:P stoichiometry have altered ecological nutrient limitation of phytoplankton growth. Phytoplankton in lakes that are less influenced by anthropogenic inputs experience relatively balanced or N-deficient nutrient supplies, but enhanced N inputs from the atmosphere during the past several decades of human industrialization and population expansion appear to have produced regional phytoplankton P limitation. Producer diversity is likely to be low when resource supply ratios are skewed in favor of one particular nutrient relative to others (11, 18). Thus, increased N loading from the atmosphere may reduce lake phytoplankton biodiversity, similar to anticipated effects of N deposition on plant diversity in terrestrial ecosystems (19, 20), by possibly favoring those relatively few species that are best able to compete for the limiting P.
… Thus, sustained N deposition that generates stoichiometric imbalance between P-limited, low-P phytoplankton and their P-rich zooplankton consumers (12) may result in reduced production of higher trophic levels, such as fish. Projected increases in global atmospheric N transport during the coming decades (24) are likely to substantially influence the ecology of lake food webs, even in lakes far from direct human disturbance. According to a paper published this week in the journal Nature, all share generic early-warning signals that indicate a critical threshold of change dead ahead. Cheryl Dybas writing for NSF.gov covers a new paper on “Early Warning Signals for Critical Transitions” (Nature, 3 Sept 2009, 461: 53-59). In the paper, Martin Scheffer of Wageningen University in The Netherlands and co-authors found that similar symptoms occur in many systems as they approach a critical state of transition. “It’s increasingly clear that many complex systems have critical thresholds–’tipping points’–at which these systems shift abruptly from one state to another,” write the scientists in their paper. Especially relevant, they discovered, is that “catastrophic bifurcations,” a diverging of the ways, propel a system toward a new state once a certain threshold is exceeded. Like Robert Frost’s well-known poem about two paths diverging in a wood, a system follows a trail for so long, then often comes to a switchpoint at which it will strike out in a completely new direction. That system may be as tiny as the alveoli in human lungs or as large as global climate. “These are compelling insights into the transitions in human and natural systems,” says Henry Gholz, program director in the National Science Foundation (NSF)’s Division of Environmental Biology, which supported the research along with NSF’s Division of Ocean Sciences. It all comes down to what scientists call “squealing,” or “variance amplification near critical points,” when a system moves back and forth between two states. “A system may shift permanently to an altered state if an underlying slow change in conditions persists, moving it to a new situation,” says Carpenter. Eutrophication in lakes, shifts in climate, and epileptic seizures all are preceded by squealing. Squealing, for example, announced the impending abrupt end of Earth’s Younger Dryas cold period some 12,000 years ago, the scientists believe. The later part of this episode alternated between a cold mode and a warm mode. The Younger Dryas eventually ended in a sharp shift to the relatively warm and stable conditions of the Holocene epoch. The increasing climate variability of recent times, state the paper’s authors, may be interpreted as a signal that the near-term future could bring a transition from glacial and interglacial oscillations to a new state–one with permanent Northern Hemisphere glaciation in Earth’s mid-latitudes. In ecology, stable states separated by critical thresholds of change occur in ecosystems from rangelands to oceans, says Carpenter. The way in which plants stop growing during a drought is an example. At a certain point, fields become deserts, and no amount of rain will bring vegetation back to life. Before this transition, plant life peters out, disappearing in patches until nothing but dry-as-bones land is left. Early-warning signals are also found in exploited fish stocks. Harvesting leads to increased fluctuations in fish populations. Fish are eventually driven toward a transition to a cyclic or chaotic state. Humans aren’t exempt from abrupt transitions. Epileptic seizures and asthma attacks are cases in point. Our lungs can show a pattern of bronchoconstriction that may be the prelude to dangerous respiratory failure, and which resembles the pattern of collapsing land vegetation during a drought. Epileptic seizures happen when neighboring neural cells all start firing in synchrony. Minutes before a seizure, a certain variance occurs in the electrical signals recorded in an EEG. Shifts in financial markets also have early warnings. Stock market events are heralded by increased trading volatility. Correlation among returns to stocks in a falling market and patterns in options prices may serve as early-warning indicators. “In systems in which we can observe transitions repeatedly,” write the scientists, “such as lakes, ranges or fields, and such as human physiology, we may discover where the thresholds are. Co-authors of the paper are William Brock and Steve Carpenter of the University of Wisconsin-Madison, Jordi Bascompte and Egbert van Nes of the Consejo Superior de Investigaciones Scientificas, Sevilla, Spain; Victor Brovkin of the Max Planck Institute for Meteorology in Hamburg, Germany; Vasilis Dakos of the Potsdam Institute for Climate Research in Potsdam, Germany; Max Rietkerk of Utrecht University in The Netherlands; and George Sugihara of Scripps Institution of Oceanography in California. The research was funded by the Institute Para Limes and the South American Institute for Resilience and Sustainability Studies, as well as the Netherlands Organization of Scientific Research, the European Science Foundation, and the U.S. National Science Foundation, among others. 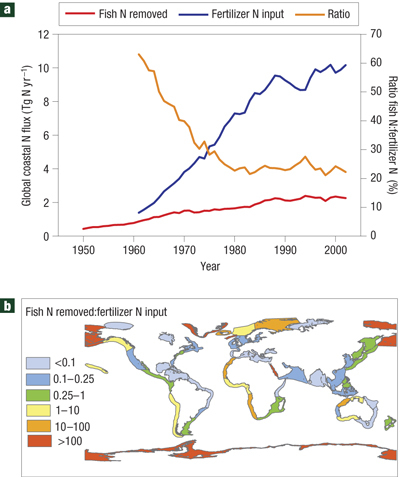 Figure 1. a, Total amount of N in fertilizer run-off (Tg N yr-1=1012 g N yr-1) delivered to the global ocean (left axis, blue line) and N returned as fish biomass (left axis, red line) per year over time. The orange line (right axis) is the proportion of fish N removed relative to fertilizer N exported (ratio fish N:fertilizer N) reported as a percentage. b, The ratio of fish N removed to fertilizer N entering 58 different large marine ecosystems (LMEs) for the year 1995. The paper shows that fishing can help reduce the impacts of nitrogen pollution. But that nitrogen pollution that destroys fisheries, through the creation of anoxic “dead zones”, can make nitrogen pollution even worse by removing a major source of nitrogen withdrawals. Similarly, overfishing the reduces the amount of fish biomass that can be removed from a system will make the system more vulnerable to eutrophication. Global International Waters Assessment is a systematic assessment of the environmental conditions and problems in large transboundary waters, comprising marine, coastal and freshwater areas, and surface waters as well as ground waters. Involving over 1,500 expert it has assessed 66 of the world’s major river basins and recently published a synthesis report. These publications are freely available online. 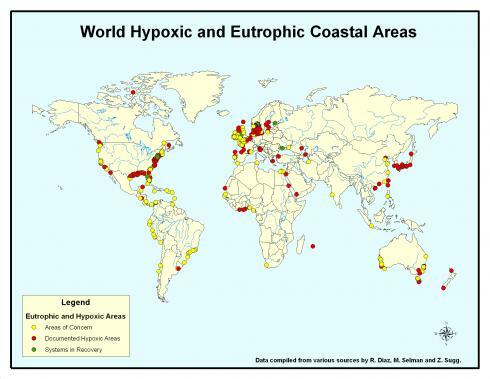 The synthesis report‘s section on pollution provides a map of eutrophication impact. 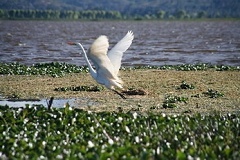 … have become increasingly common in the world’s lakes, estuaries and coastal zones, with serious impacts on local fisheries, biodiversity and ecosystem functions. Extensive dead zones have been observed for many years in the Baltic Sea, Black Sea and Gulf of Mexico. 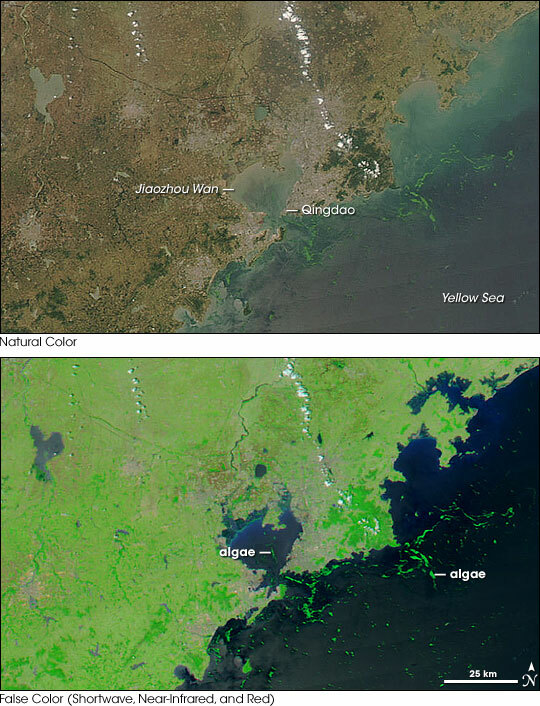 The GIWA assessment has compiled information on dead zones in the Southern Hemisphere, including several lagoons in the Brazil Current region, coastal locations in the Humboldt Current region, and in the Yangtze River estuary located in the East China Sea region.